It probably depends on your kid more than anything else as far as the best approaches. My son is a Nerf and toy gun fanatic. Our rules are that he can't shoot the real guns unless he treats the toys right (muzzle awareness around people/pets and finger off trigger until ready to shoot). That has motivated him very well. To start, he would shoot the single shot .22 resting on sandbags - it took a bit to get him dialed in on sight picture (open sights), but once it clicked he's off and running. Make it about loading, sight picture, and trigger control...not holding up or maneuvering the gun at first. He was also given a BB pistol from his grandpa - that's sort of an intermediate step to handguns which has been going well. I started my daughter with a Crickett rifle with a pink synthetic stock, which is the same action as a Chipmunk rifle. Its a perfect rifle to introduce firearm safety and shooting to a young child. The bolt has to be manually cocked even after loading. There is a safety lock which prevents the bolt from being opened or closed. The length of the stock is also made for a young child. Last of all the rifle is accurate. 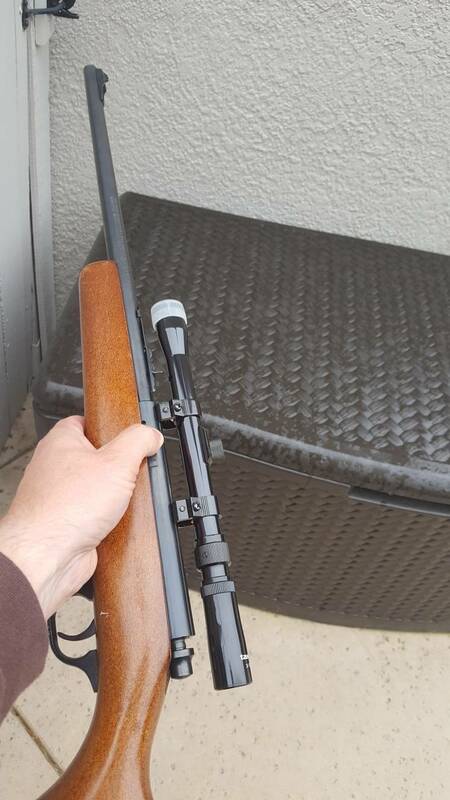 The iron sights are junk, so I put a 2X Leupold scope on the rifle, and it could hit a dime at 25 yards every time. I also bought some plastic training ammo from Dillon Precision. https://www.dillonprecision.com/saf-..._32_25225.html My daughter and I went through many sessions at home, using the training ammo on how to load, fire and unload her rifle, and the safety aspects of firearm handling. By the time we went to the range, she fully understood the how to operate and handle her rifle, leaving us to work on accuracy. I started her at 5 years old, and a couple of years later, she has graduated to a Ruger 10-22. Last edited by RandyD; 04-15-2019 at 8:48 AM..
Only mistake I’ve made with my 4 year old (if you want to call it a mistake) was engrain the fact that she wasn’t supposed to handle, touch or mess with firearms until she was older. Now that I think she can handle this particular firearm after the training and supervision I listed above she is less than excited about it. She wants to go “hunting”, shooting and the like but she decided she isn’t old enough compared to the adults she has seen handling and firing guns. I have engrained enough respect for firearms in her mind that she dosent fit her own standard for being able to handle guns. Mature thought process for a kid sure, but I’ve actually created a mindset with her where she has solidified her belief that she needs to be an “adult” before she can partake in a hobby she wants to do. The Benjamin Discovery is a great airgun to start with if you go that route, but if you've already got an appropriate .22 seems like you're set. On our first shooting lesson, I used her rifle to shoot a potato, to show her the destructive nature of firearms, and to instill in her that firearms were not toys. On the topic of handling firearms, our rule was she could handle any firearm by asking first, and if she asked, I never denied her the opportunity. Following this plan, she never developed a fascination of wanting to secretly handle a firearm. Several times, I intentionally left an unloaded firearm out where she was playing, while I watched her, and when she discovered the firearm, she called out to me that I had left a firearm out. It has been 10 years since I started her on firearm handling and it has paid off. Her respect and safe handling of firearms is always present. I hope you have the same success that I have had. I grew up using this marlin and plan on my daughter using it as well . Is this basically a cricket? It's 33-1/4" overall. I too put a red dot on my sons first gun, Savage Rascal (single shot .22). I also put a mini bipod on it for prone shots. This was from 3 years ago when he was 4. Well, handling fire arms in a safe manor, is (or should be) the primary lesson. It sure was for me, and my daughter. With her ‘mindset’, she is more ‘adult’ than many ‘adults’. Some gain wisdom & maturity with age, others just age. For what it’s worth, I started my daughter with my old Win 94 .22lr (with scope). I later bought her a 10/22 compact. It has iron sights and she shoots it well. She really enjoys the rim fire steel range at Sac Valley (who doesn’t). She also has a compact 20ga SX3 and really enjoys that. She shoots trap with me and has hunted Dove, Pheasant, & Turkey. Last year I bought her a compact X-Bolt in .243, topped it with a Leupold VXll 3x9x40. We will be hunting Deer locally & Antelope (WY) this fall! Keep things safe, don’t rush anything, and the shooting FUN! Reactive targets work really well! Last edited by XVIga_Rob; 04-15-2019 at 5:38 PM..